Stick It On is a brilliant, simple idea that always puts a smile on people’s faces and makes a party perfect! Having been lucky enough to attend 3 events where Stick It On were present, I knew that I wanted them at my birthday party. Suffice to say they didn’t let me down. A fantastic time was had by all and I would not hesitate to book them again! Having Stick It On at my party absolutely made the night. All of my friends and I had a fantastic time, and it will be remembered for a long time to come. Rob was brilliant from beginning to end, and I cannot recommend him and Stick It On highly enough. Thanks again! Stick It On helped make my 40th an epic night. Having your friends select and play the night’s music adds so many levels to a party from the anguish of ‘what shall I play?’ to ensuring the dancefloor was full! Hand on heart I can honestly say that my 40th far exceeded my expectations, thanks largely to using Stick It On. Encouraging your friends to get involved is an absolute masterstroke as it creates such a great vibe as well as some above average music – no-one wants to be the worst DJ! Above all, the guys as SIO make everything seamless and easy so you can relax and have a great time. 10/10 is my rating, I would totally recommend them on the basis they were faultless. Hi Rob, I just wanted to say massive ‘thank you’ for my 40th birthday party. I had the best night partying & everybody loved the whole stick it on experience. The whole experience from my first enquiry to the actual party has been a breeze & so much fun too. I have sore feet from all the dancing but it was so worth it! I would recommend stick it on to everybody wanting to do something just a little bit different (and with such a helpful & accommodating DJ Rob). What can I say – Stick It On were simply AMAZING! Rob is a super nice guy who totally got our theme for the evening. It was sooooo much fun, & our friends are still talking about it. My photos are too horrific to share, I know that Rob took some but if you need some more please let me know. Again thanks for the recommendation, & I would not hesitate to recommend them to any of your clients – such a fab unique evening – I want to do it all over again this Friday! Thanks to Rob for hosting my 50. birthday party. It was agreat success . It was amazing to be able to choose music for a whole evening, and only dance to songs of my choice. It was my gift to myself and I thoroughly enjoyed it. I wholeheartedly recommend Stick it on. Stick it On creates the soundtrack to your party! They are professional and will add a great vibe to any celebration. I can’t recommend Rob and his Team highly enough – they are awesome! I have been to a few Stick it On events and each time they get better and better… I booked them for my 50th, which even though i’m old now, was not a sluggish event. Gaz was perfect. We had some very unique DJs with us that night and even some unmentionable antics. Gaz was a real pro, handled everyone from 82 to 15 with the same fun and care. I have had so many positive responses and so many laughs since that night. Please don’t hesitate. Stick it On is the only party you want to be seen at !!! Perfect and cool! Love It ! Really wanted to thank you for an absolutely legendary party on Saturday – it couldn’t have been any better! It even far surpassed my expectations! You worked so hard on the night Rob, and Mitch beforehand (getting all those tracks together). My guests absolutely loved it; and I know it wouldn’t have been half the party it was without Stick-it-on. Everyone really embraced their ’15 minutes of fame’ behind the decks. Most of them said it was the best party they’d been to – which is praise indeed!! Thanks so much to both of you (and anyone else behind the scenes) for doing such an amazing job; I won’t hesitate to recommend you to everyone. Everyone really enjoyed themselves and had a great time. We had lots of comments afterwards about how great stick it on was, especially from people who didn’t know what to expect. Lots of people who hadn’t DJ’d had wished they had. From initial discussions to the event Rob and Mitch were organised, patient and accommodating. All our guests who DJ’d were impressed by the ease of registering and the efficiency of the service. 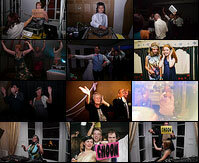 The night itself ran very smoothly and was so much fun for the DJ’s and the guests. It’s such a great idea and I would recommend it to anyone and all ages who wants something different at an event which will make it very memorable. We had so much FUN! I just wanted to say a massive thank you for supplying the music for my party yesterday. Hands down I have to say it’s the best party I have ever been to and all of my friends and I had an amazing time. I wish I could do it all over again! It’s such a great concept that gets everyone involved even if they are not DJ’ing. Even my sister who didn’t want to DJ got up and had a fabulous time. Nick was very friendly and was great at keeping the crowd going before, after and during the DJ slots. A really nice guy. Everyone I’ve dealt with has been very professional and I am so glad my friend recommended you, as it was truly a night to remember. It’s like nothing I’ve ever done before and was such a great experience. I will definitely be in touch for other events in the future and will recommend you to anyone who asks! Basically it was an amazing evening, that neither myself or my Guests will forget for a long time. They all said best party ever, Stick It On is over and above a whole different experience from a regular disco / DJ party. I can not stress enough how great Rob was on the night, so accommodating. I’m still on cloud 9! Thanks so much. “I have been attending Stick It On so it only seemed right to have them on board to help me celebrate my 30th birthday. We met with Rob to discuss all of the details and then he took it from there! The whole process from meeting up, to my friends applying to be Superstar DJs, right through to the end of the night, was brilliant. The actual night was, and still is, one of the BEST nights of my life and the Stick It On team definitely helped to make it happen. They had all the best equipment and lighting and it all went very smoothly, even after quite a few drinks were consumed!